Focaccia is pronounced foh-KAH-chee-ah. A speedy version of this recipe can be made with frozen ready-to-use pizza dough. Allow the dough ball to thaw and roll it to fit the pizza pan. Frozen pizza dough may not have the natural flavour of homemade pizza dough and will probably be higher in salt and lower in fibre. 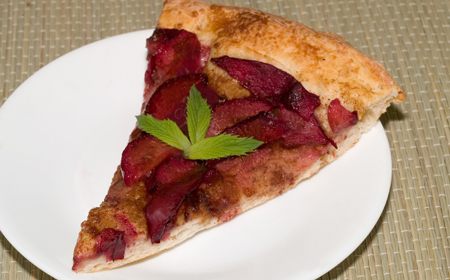 Apple slices or canned and drained plums or peaches can be used for this recipe. 2 In another bowl, combine the warm water, sugar, and oil. Add the liquid mixture to the flour mixture. Using a wooden spoon, stir until the dough comes together and forms a ball. You may need to add a little more flour, tablespoon by tablespoon, until the dough becomes less sticky. 3 Turn the dough out onto a lightly floured board and knead gently until the dough feels more elastic. Shape it into a ball. 4 Place the dough on a lightly greased pan and leave at room temperature until it has doubled in size. 5 Using your fingertips, spread the pizza dough to the outside edges of the pizza pan. 1 Brush the dough with the melted margarine. 2 Wash the plums. Cut each plum in half and remove the pit (stone). Place the plums on paper towels to blot up the excess juice. Cut each plum half into 3 pieces. 3 Combine the brown sugar, cinnamon, cloves, nutmeg, and ginger. Sprinkle half of the sugar/ spice mixture over the focaccia dough. 4 Arrange the plums cut-side-up on top of the sugar/spice mixture. Sprinkle the rest of the sugar/spice mixture over the plums. 5 Bake for 20 minutes. Allow to cool before serving. Cut into 8 pieces. A plum is a pitted fruit related to the nectarine, peach, and almond. These are all "drupes": fruits that have a hard stone or pit surrounding their seeds. Plums are good eaten fresh, canned, or made into jams and jellies. They are a great source of vitamin A, vitamin C, potassium, and fibre. Plums are also rich in antioxidants, which are associated with a reduced risk of cancer. A prune is a dried plum. Prunes stimulate the bowels, an effect caused by the fruit’s skin.